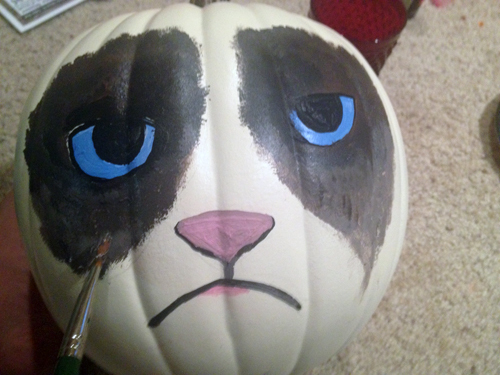 Each year on my blog, I get geared up to do atleast one celebrity pumpkin. This year, my celebrity pumpkin wasn’t the obvious choice Amanda Bynes (truthfully, I think the girl has problems). 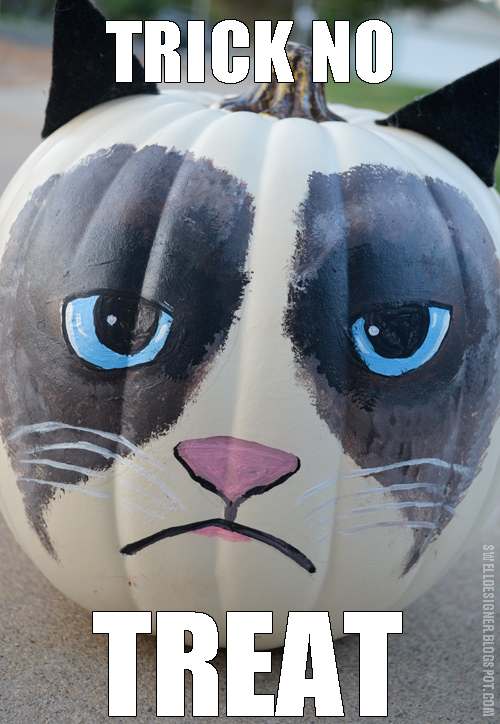 It was the favorite cat on the internet of the moment…Grumpy Cat! Grumpy Cat a.k.a. Tarder Sauce has taken the internet by storm, so why not pumpkins too, right? 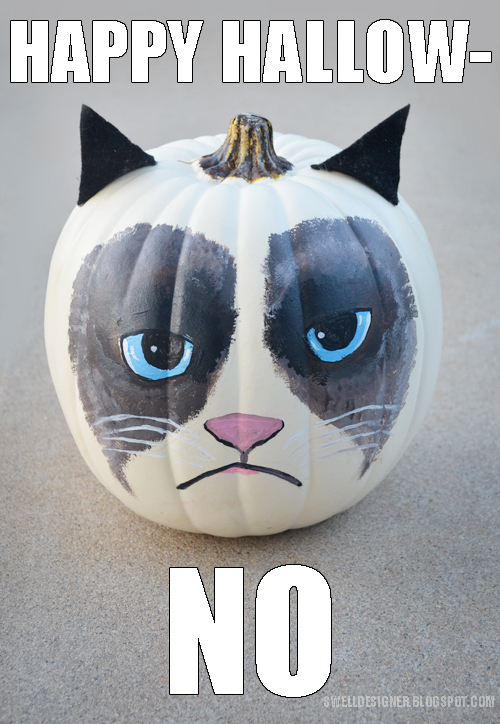 Now here’s how you can make your very own Grumpy Cat pumpkin! 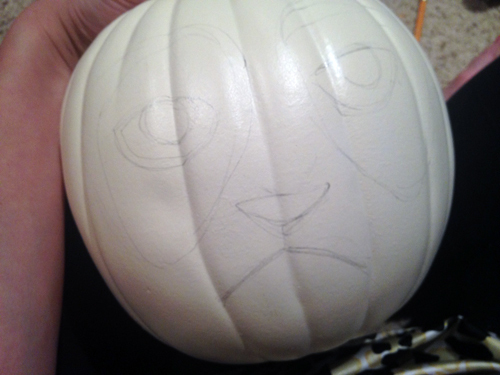 First up you’ll want to trace on the Grumpy Cat face with a pencil. I referenced some photos of Grumpy Cat I pulled up in a Google image search on my phone. 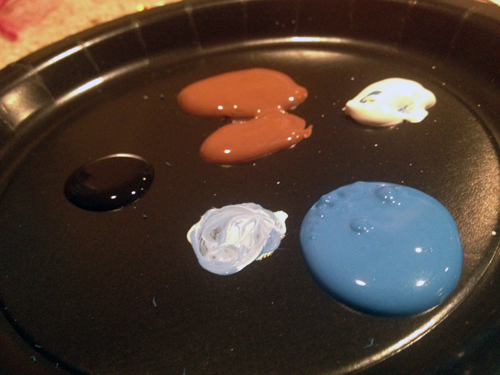 I poured out my Tulip Soft Paint colors. I left plenty of extra room for mixing colors on my plate. 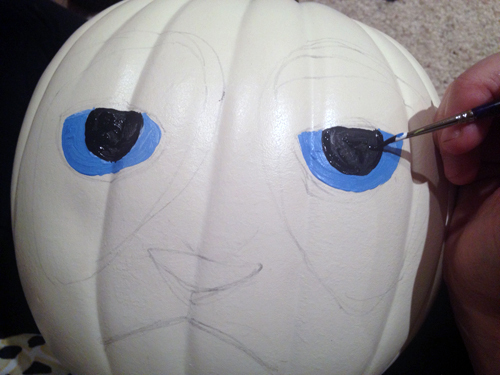 I next painted the iris and the pupil in a sky blue and black for the pupil. Then I outlined the entire eye with black. 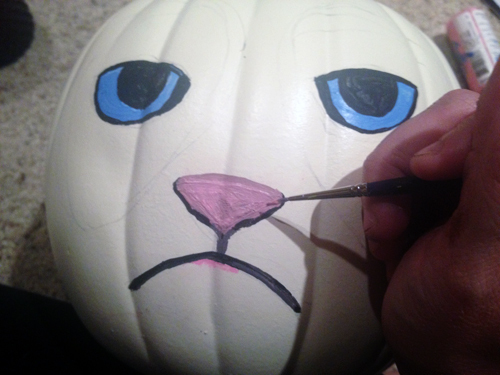 Next up was painting the mouth and the pink of the lip and nose. I outlined under the nose to suggest nostrils and a little bit of a shadow. I then mixed black and brown together to make the patches of brown around his eyes. I actually used more darker colors around the eye. 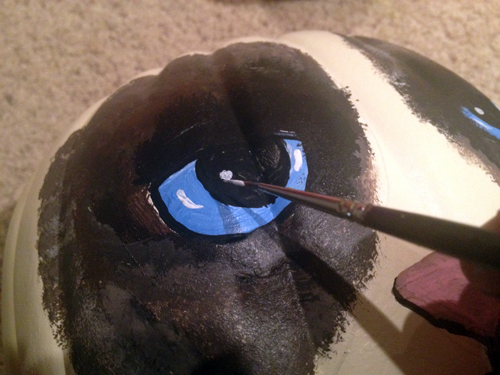 I also used the bristles of my angle brush to fan out around the outside of the patch to look like fur. 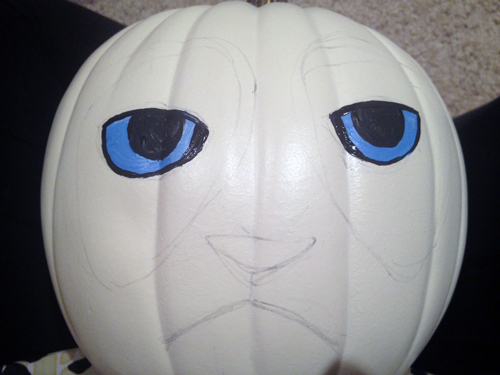 Now I went back in and added details to give the eyes life using white paint and the liner brush. 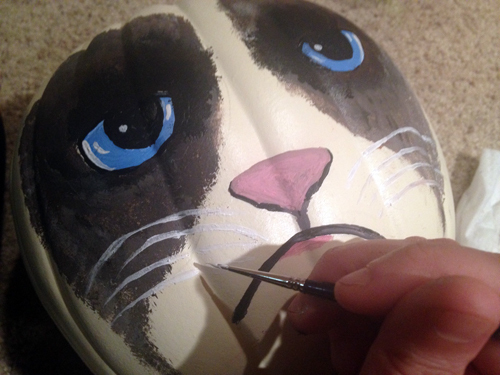 My final painting step was to paint on whiskers. This is the one I still need a bit of practice on! I struggle with fine line detail while painting. The final step was to hot glue on the ears using basic felt. I pinched them in the back and glued them down at the edges to make them perky, attentive ears! I had fun making some funny meme pics using my new pumpkin. 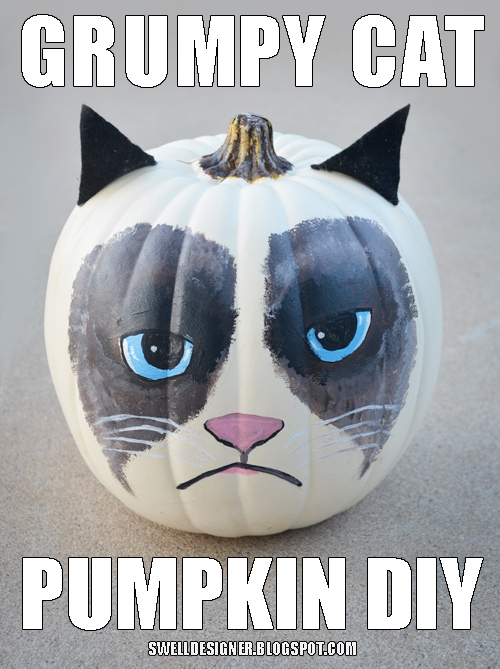 As you can tell, Grumpy Cat is NOT looking forward to the upcoming Halloween season. 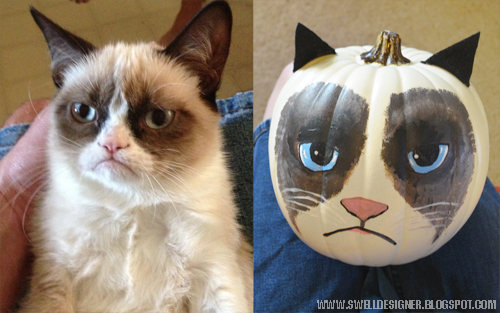 Here’s a comparison of the real Grumpy Cat with the pumpkin version. I tried to recreate the original photo that went viral on Reddit, but darn it! 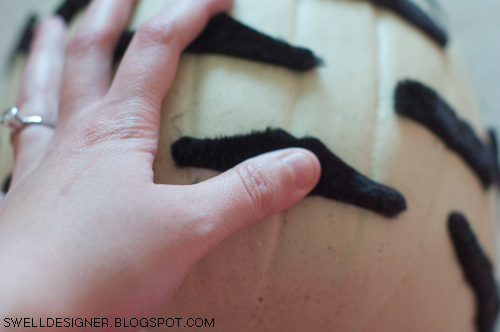 I forgot to put my hand behind the pumpkin head. 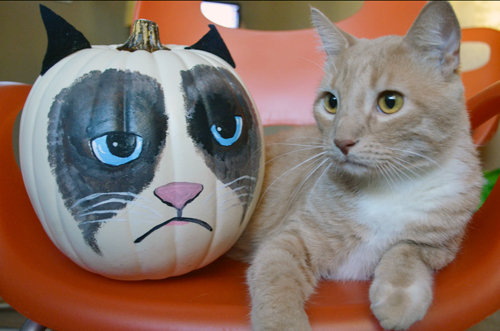 My cat Dexter isn’t really liking all this attention the Grumpy Cat pumpkin has been getting. Turns out that Grumpy Cat makes other cats grumpy too! I would say the mustache trend has been going on now for about 7 years and I don’t see it dying down anytime soon. 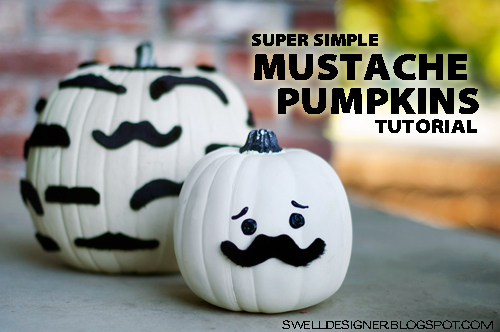 If you are a mustache lover or know someone who is, they’ll get a super big kick out of these goofy pumpkins. The cool thing is they are probably the easiest thing to make EVER and you can have them done in 15 minutes flat! 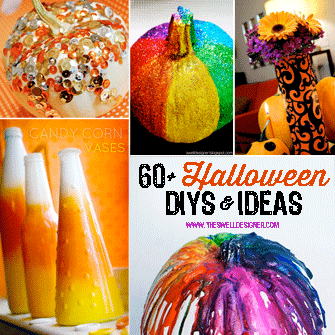 Perfect for a quick porch decoration or cute gift for the Halloween hostess. And for the record, this project is dedicated to my Daddy, my favorite mustached man! First gather your supplies! 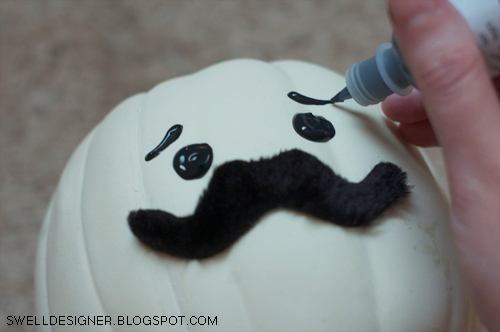 You need: 2 pumpkins (1 medium, 1 small), 5 packs of faux mustaches (I got mine for $1 each at the Dollar Tree), and one bottle of Scribbles 3D Fabric Paint. Optional: Cute cat who is very photogenic. 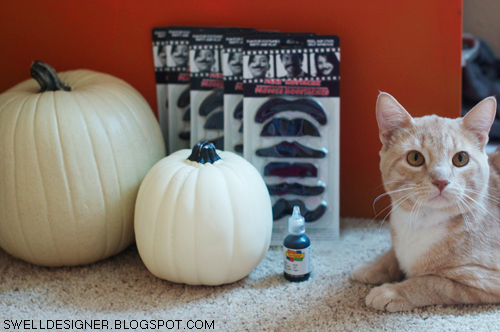 For the large pumpkin, I simply removed the adhesive backing on the mustaches. 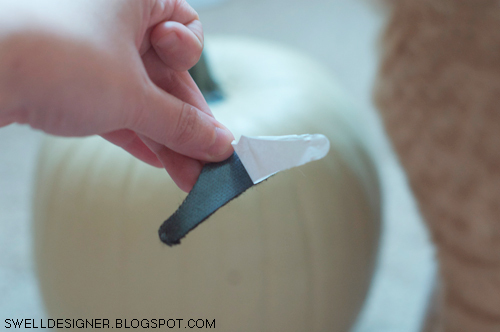 And firmly pressed them in place all over the pumpkin in a random pattern. I found that 5 packages (25 mustaches)was just the right amount for both of these projects. 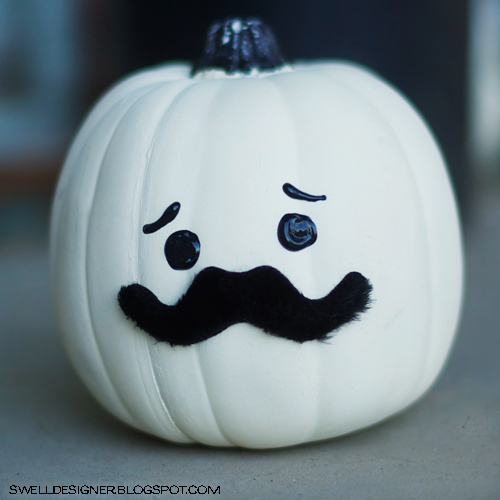 For the small pumpkin, I simply slapped on the mustache, and used the Scribbles paint to add cute eyes and eyebrows. You can play with the design of his face. I wanted a sweet look, not a scary one. If you are wanting a happy or scary design for your pumpkin face, I suggest you look up “happy pumpkin”, “cute pumpkin” or “scary pumpkin” in google image search. 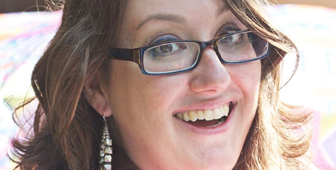 You’ll find all kinds of fun faces to pattern your off of! 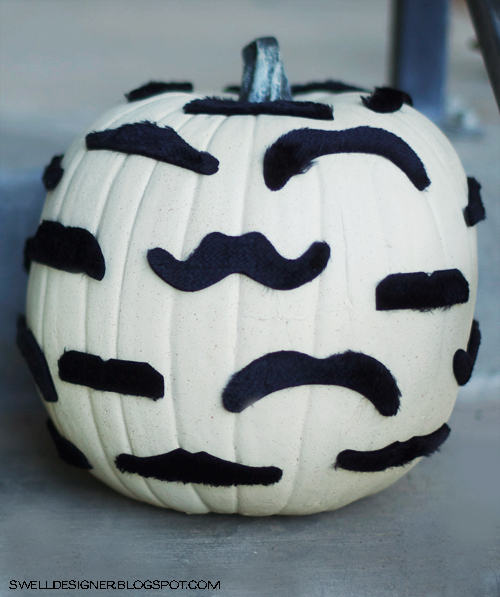 Here’s a detailed look at the all-over mustache pumpkin. And the cute little pumpkin man. I think he turned out cute with his handlebar mustache! Thanks for letting me show off my flavor saver pumpkins today. LOL!